Help Desk, Service Desk, Call Center… What's the Difference? Help Desk, Service Desk, Call Center… What’s the Difference? I remember when I first heard about the help desk. It was like hearing about UFOs – No matter what I read on the subject, I still had no clear idea what it was and how it could help me. Then there are the terms and acronyms that can make even the sanest person go mad. SLAs, ISTMS and IT help desks further muddle the waters. So what is what in this jargon maze, and what do all of these funny terms mean? A help desk is likely all about email management and shared inboxes. A service desk is a trouble ticketing and issue tracking system. There’s ITIL, ITSM and IT Service Management related standards. Call centers, or departments that accepts and responds to calls. Knowledge base systems, internal or external help sites. More or less, they refer to software, tools, departments and standards designed to provide customer service. 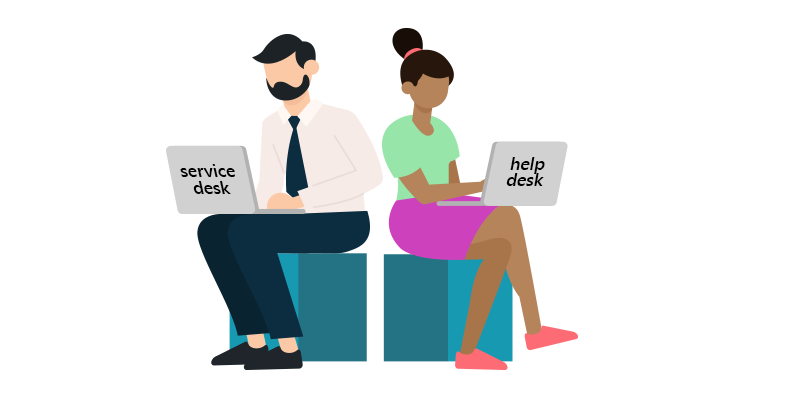 Depending on who you talk to – IT professionals or customer service reps, some will claim that the words “help desk” and “service desk” are different in the sense that help desks are designed to offer “help” while a service desk provides “service”. In a way, they’d be right. One person’s “help desk” could be another person’s “service desk”, with their own vision of it. ITSM professionals, industry analysts, journalists, or even members within an organization can have their own name for it. Using one term over another depends on what you’re talking about, who you’re talking to, the level their knowledge on the subject, etc. Most likely, the individual using this term is likely referring to a request management software beholden to an IT department or an organization charged with managing IT systems and services. In this context, while a help desk is designed as an add-on for existing IT activities, the service desk designed to work as a service-based delivery method (hence its name). The word “service” suggests there’s a single point of contact between the service provider and the user. Now, the full-fledged “service desk” can have a “help desk” component as part of it. For example, a service desk may recieve an “incident” or a “question” wich might be directed to a help desk, while the “service desk” only deals with the service requests essential to the operation of the IT department. One could use the IT prefix to remove any doubt that they’re absolutely, positively referring to IT. That’s right, a service desk can also be called an “IT Service Desk or IT Help Desk” – specifically, (to avoid confusion) to refer to a system capable of managing the “service life cycle” or the lifecycle of IT processes. Importance is placed on things like coordination and control across all necessary functions needed to manage IT services – with the aim of continuous improvement. IT departments need a system flexible enough to changes with an effect on IT services (tools, processes, documentation, etc). This means that a desired system should enable beneficial changes to be made without (or with minimum) disruptions to IT services. ITIL refers to an infrastructure library that offer best practices for incident management. It also allows organizations and departments to decide how and where to assign the work – including efficiency, accountability and service standards. Essentially, the proper service desk definition was born out of the ITSM best practice framework. The idea of “managing IT as a service” had a definite role in guiding IT organizations to implement a service desk, including implementing and enforcing various ITIL recommendations for it. A call center (or call centre) places refers to a place or area where telephone calls are handled, and is often used to describe an organization’s department of telephone support operators. The term “contact center” used interchangeably not only to include telephone systems but also help desk software, as well. It’s also a loose term used to refer to a customer service department of an organization. A remote or virtual call center can refer to operators (in groups or as individuals) working from home, remotely or as part-time advisors to smaller branch offices.) This is largely possible due to cloud technology and the ability for centralized customer service software to accommodate such operators. Businesses may want to build a help center (also known as a help portal) that allows users to find answers themselves. This could consist of a self-service guide, wiki, faq, online manual, user guides or a simple document depository. A powerful search, easy navigation and “suggestion” for the end-user is important in this case, as the user is presented with an answer with minimal clicks. A knowledge base should be cleanly integrated with your help desk, not only for easy access and linking between content, but to understand how your users are using your self-service. This is important in order to keep customers happy. In today’s world, with various definitions being strewn about left and right, you’re left to your own wits to try to say (and mean) the right thing. It really depends on your organization, the work you do and what you expect out of your software. Remember, even if you don’t meet your users, your software is a conduit between real people. Building relationships isn’t only limited to small businesses or mom-and-pop stores – but also to IT or brick-and-mortar businesses. And whoever it is that your’e serving, the easier it is for your users to reach their goals, the more engaged they are with you – and the higher value they extract from your user. Just as the nature of your business, culture, employees shape your help desk decisions, so should your ideal customer experience, too.